In a professional selling environment, bringing credibility to the table is essential. 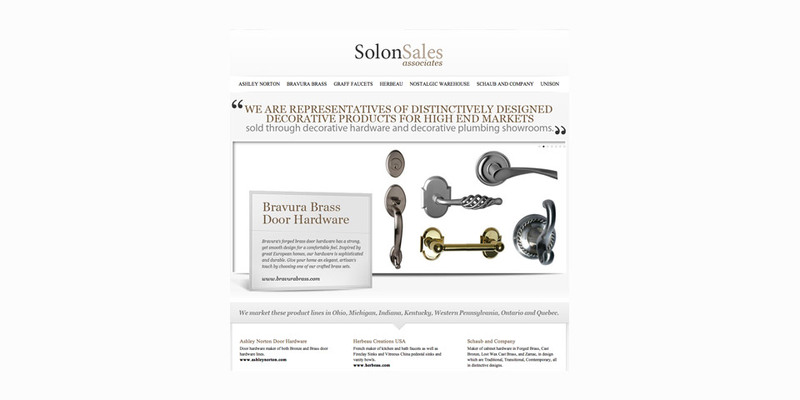 Solon Sales Associates is a leading sales representation firm for decorative hardware and decorative plumbing fixtures. They engaged Boom Creative to develop a solution that established their reputation and presented their lines. At Boom-Creative we know every web site has a unique goal. We won’t impose a one-size-fits-all solution on your project. We are adept at listening to your needs, asking pertinent questions and providing initial solutions that show you the range of possibilities.